In November of 2015 F. Kanani Sensei traveled to Denmark Europe to honor a special invitation to train and to reunite with the legendary Masahiko Tanaka Sensei. Kanani Sensei was honored and overjoyed of the warm welcome that both the people of Denmark as well as Tanaka Sensei offered. The four day special training and instructors camp was excellent as expected and F. Kanani Sensei is looking forward to further colobarations in the near future with Tanaka Sensei. JKA Hamptons New York / JKA San Diego International and Chief Instructor Falah Kanani are hosting this years 2015 New York ATKF International Summer Camp. The camp will be held at Camp Quinipet in the beautiful Hamptons / Shelter Island, New York. This year�s camp is open to all traditional karate styles and all ages. You all are cordially invited to join us in this four day camp of true traditional karate as taught by the Sensei of the Sensei�s of all the Shotokan World: H. Nishiyama Sensei. The lead instructor of the camp will be the world renowned instructor, Sensei F. Kanani, a lifetime student of Nishiyama Sensei and a world-class international instructor. Furthermore we will have a fantastic team of guest instructors such as Sensei Antonio Walger from Brazil, Bejar Fuzliu from Kosovo / Philadelphia and JKA San Diego's Head Instructor Sensei Sidney Dobbin from Brazil. The camp will be held Friday August 28th to Monday August 31st, 2015 with our ATKF Nationals / Goodwill International Tournament. The camp fees are $ 399 for 4 days, 3 nights including all seminars, camp accommodation (beds) and meals. You will need your own transportation such as flight, airport pick up and ferry rides. The tournament fee will be $ 50 per event. No affiliations to any organization are needed just the interest in continuing and studying the true way of Nishiyama Senseis traditional karate teachings. Kumite, kata and basic training as he taught it. Don't miss this opportunity to train on the beautiful Shelter Island in the world famous Hamptons, New York. The deadline for the registration will be June 30th, 2015. In loving memory of my life long partner who has always been by my side. She has been my silent strength in the times of turmoil for over 30 years. At times, when I did not think this journey was worth continuing, it was she who pushed me. I have excelled because she encouraged me. June 11, 2010 - The Japan Karate Association of San Diego and it�s cheif instructor, Sensei Falah Kanani, were invited by the U.S. Marine Corps in San Diego to give a seminar/demo at their Martial Arts expo. They were very much pleased with the quality instruction and the performance that was given. Tuesday, Thursday 8:30 - 9:30 p.m.
Saturday 12:30 - 1:30 p.m. Team Training: Tuesday, Thursday 9:30 - 10:00 p.m.
How to join It's Simple! If you are interested, come and observe a class or, ask for a complimentary trial class. You can also visit other schools and compare the programs. No contract is required. Different styles are welcomed in our dojo. 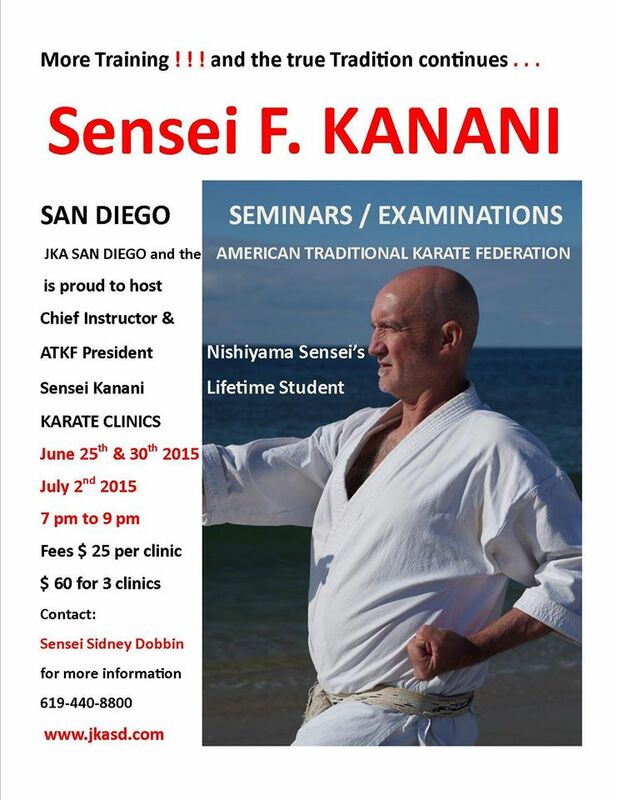 Sensei Kanani is also available for seminars and clinics, in US and world wide..